Russia’s English-language television network will begin running two interview shows by the legendary journalist, starting in June. Legendary American interviewer Larry King is joining Russia’s English-language TV channel RT with a global reach of over 630 million people, RT reported on Wednesday. “RT will air the new show ‘Politics with Larry King’, produced by Ora.tv in June as well as ‘Larry King Now’, which was launched on Hulu and Ora.TV in July 2012,” the Moscow-based channel said in a statement. 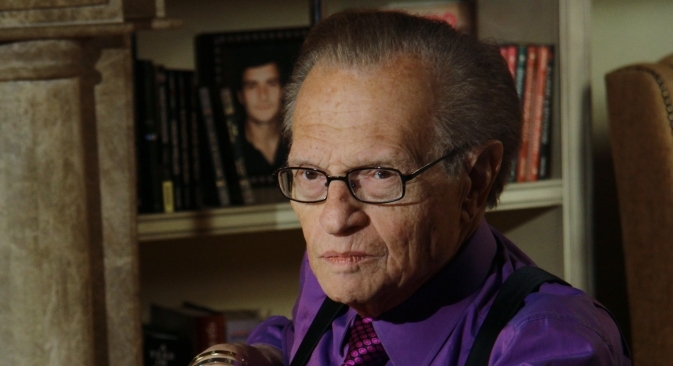 “Larry King Now” is a web series featuring one-on-one interviews with “the day’s most fascinating newsmakers, celebrities, world leaders and internet stars.” King has interviewed every American president since Richard Nixon, and his latest interviewees include No. 2 on the Forbes Billionaire List Carlos Slim and former U.S. Defense Secretary Donald Rumsfeld. The show, to be aired four times a week on RT, is similar to King’s previous television series, “Larry King Live,” which ran on CNN from 1985 through 2010. King has done more than 50,000 interviews, including two with Vladimir Putin, in 2000 and 2010. According to RT, King’s shows will be recorded in RT America’s Washington, DC, studios and Ora TV’s studio in Los Angeles. “RT America will be the exclusive US broadcaster for both programs, which will continue to stream online at Hulu.com and Ora.tv and also be available online on rt.com,” the channel said. “I would rather ask questions of people in positions in power instead of speaking on their behalf, and that’s why you can find my show Larry King Now right here on RT,”said King, 79, in a video posted on the RT website. “I have always been passionate about government and issues that impact the public, and I’m thrilled at the opportunity to talk politics with some of the most influential people in Washington and around the country,” RT cited King as saying.